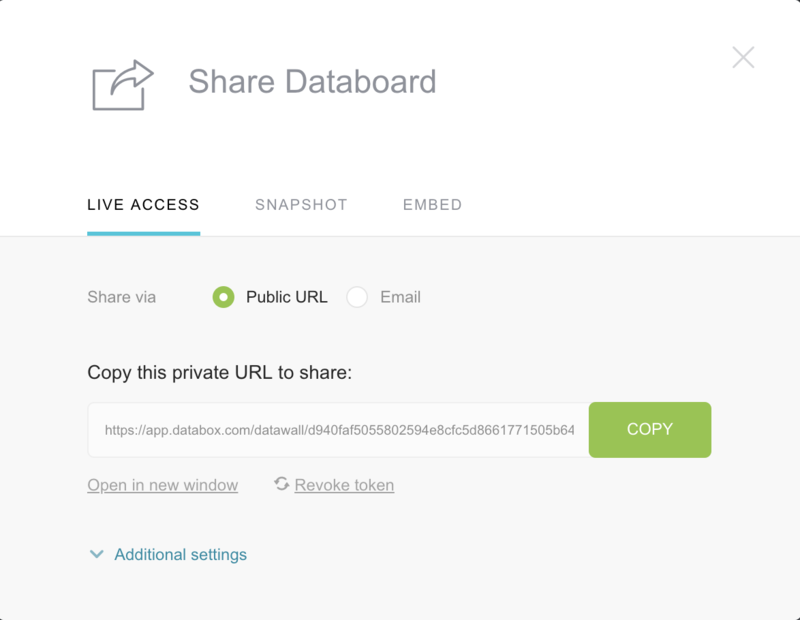 Databoards can be shared with people who are not a User on your Databox account. Everyone you share it with can see and interact with your Databoard. While they don't have the ability to create new Databoards or save changes to existing ones, everyone can see the changes that you make. For security purposes, you have the ability to protect your Databoards with a password. Navigate to Databoards in the top menu bar. Select the Databoard which you want to share and click on Share Databoard icon . You can do the same in the Designer Tool by clicking on the Share Databoard icon. Here you can copy the Public URL, limit it to certain IP addresses, protect it with a password and even loop several databoards. To access this go into "Additional settings". Click Share via Email and enter the email addresses that you want to share this Datawall with and click on Send. You can again protect your Datawalls with a password or loop them. An email with a link to the shared dashboard will be sent to the recipients.